Parts one and two of this volume present the theoretical lenses used to study the social contexts of education. These include long-established foundations disciplines such as sociology of education and philosophy of education as well as newer theoretical perspectives such as critical race theory, feminist educational theory, and cultural studies in education. Parts three, four, and five demonstrate how these theoretical lenses are used to examine such phenomena as globalization, media, popular culture, technology, youth culture, and schooling. This groundbreaking volume helps readers understand the history, evolution, and significance of this wide-ranging, often misunderstood, and increasingly important field of study. 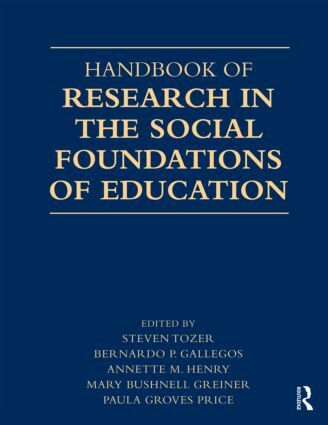 This book is appropriate as a reference volume not only for scholars in the social foundations of education but also for scholars interested in the cultural contexts of teaching and learning (formal and informal). It is also appropriate as a textbook for graduate-level courses in Social Foundations of Education, School and Society, Educational Policy Studies, Cultural Studies in Education, and Curriculum and Instruction. Why is the School Basketball Team Predominantly Black?